Running Time: 2 hrs 12 mins. "The deadliest sniper in US military history," called Chris Kyle on the cover of his best-selling autobiography of service during the Iraq war. The year after the book came out, in 2013, he was shot to death by another war veteran suffering from post-traumatic stress. An ironic because Kyle himself - as portrayed in the film - who managed to leave the war behind him. "American Sniper" has in common with Kathryn Bigelow's "The Hurt Locker", but is less advanced. A straightforward story about a regular guy from Texas who would have continued living as a rodeo cowboy unless people started bombing American embassies in the late 90s. "Look what they did to us," he says indignantly front of the TV. The next moment he stands inside an enlistment office. Cutting is sometimes almost seamless well but undeniably effective. Young Chris learns early on that there are three kinds of people: "sheep, wolves, and sheepdogs." It is the last kind you want to belong. From there, Clint Eastwood draws a straight line to the Chris Kyle many years later, on a roof in Fallujah, don’t hesitate long before shooting an Iraqi boy with a grenade in his hands. His mission is to protect his fellow soldiers. Anyone who feels bad of un- covered patriotism should not look "American Sniper". It is logical that the Republican Clint Eastwood taking on this project. Basically, this is a heroic tale of a man who killed at least 160 people out of the ambush. It rhymes a little shabby. With the twin films "Flags of Our Fathers" and "Letters from Iwo Jima" Eastwood wanted to portray both sides in a conflict. 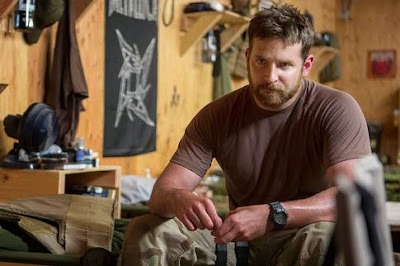 The ambition glimpse into the 'American Sniper'. We will see that even the Iraqi sniper has a wife and a baby. At the same time need not be sure of which ones are the good ones. The Iraqi civilians are suffering, but they sound on the other hand their children to become suicide bombers. A shaded Bradley Cooper, who also produced, carries this film on its purpose-inflated arms. He is one with the role, worthy of his Oscar nomination. Cooper and Sienna Miller as Taya Kyle is a fine pair. Eastwood is good at portraying life's core values as well, and succeed somewhere to get his relationship to become the most important thing in the film.